The Software supports all Exchange Server (2003, 2007, 2010, 2013 & 2016), Windows & Outlook Editions. The EDB to PST Converter Software converts the complete data of Exchange EDB file (Emails, Calendars, Tasks, Journals, etc.) to Outlook PST file format. It performs the entire conversion along with the attached data and maintains email formatting during conversion. By using the software one can easily import EDB to Outlook email client. The utility provides an interesting feature which removes the additional overhead of importing the Converted PST file into the exchange server. Say you are an Exchange Server 2000 user and wants to migrate to Exchange 2007/2010/2013. In such situation you can use this tool to transfer EDB to new Exchange Server. The software supports the conversion of password protected, encrypted or corrupted Exchange EDB (priv1.edb & pub1.edb both) file. You can use this tool to view and convert the data of Exchange EDB file to desired file format. The tool not only convert edb to pst but also transfer EDB emails to MSG, EML, PDF and HTML file formats, you can choose any one of these file formats while converting EDB emails into one of them & can use further in different email-clients such as Outlook Express, Windows Live Mail, Netscape Entourage, Mozilla Thunderbird, MAC (Apple) etc. 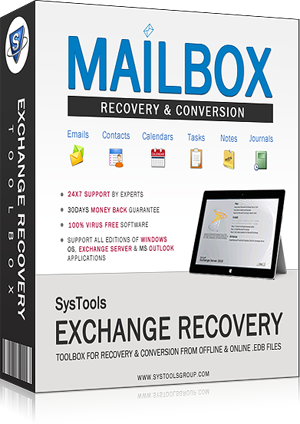 Exchange EDB to PST converter software comes with the powerful feature, you can recover deleted items like Calendar, Contacts, Deleted Items, Drafts, Inbox, Junk E-mail, Journal, Notes, Outbox, Sent Items, and Tasks along with the attachments. The maximum limit assigned for storing data in an EDB file in MS Exchange server 2003 is 16 GB, 2007 is 50 GB, Exchange 2010 is 1 TB & Exchange 2013 is 16TB. When Exchange EDB file exceeds this limit, it leads corruption in Exchange Database. Microsoft EDB to PST Conversion Tool facilitates provision to resolve oversized corruption issues. While converting edb to pst, the utility offers an option to split the resultant large size PST file into smaller and manageable size. For this, choose the required size of PST file & the software will create multiple PST file (equal size) of the selected size. This Exchange solution is embedded with potential to handle JET Engine (like Jet Error 1018 JET_errReadVerifyFailure, jet error 1019 JET_errPageNotInitialized, Jet error 1022 JET_errDiskIO errors). The software offers an option to export the selective items from the EDB file. Just mark the items that you want to extract to PST, MSG, EML, HTML or PDF file format. Exchange EDB to PST Software takes high responsibility on its shoulders to recover and convert Priv1.edb, pub1.edb & mailbox database.edb file to pst format. The latest edition of the software support all editions of Exchange server and Outlook. The tool has an interactive GUI and can be run on all of the Windows OS editions such as Windows 2010, 2008, XP, Vista, Win 7 and rest of the editions. View the complete video to understand the working of the best EDB to PST Converter. Is there any additional application required to run the EDB to PST Converter Tool? No,it doesn't require any additional application because it is stand-alone software. Can this tool can convert Corrupted, Dismounted and Password Protected EDB files? Yes, this tool can convert corrupted, dismounted and password protected EDB file to PST Format. Is there requirement of live Exchange Server to Convert EDB file to PST? No, live Exchange Server is not needed to perform migration. Can I convert Priv1.edb and Pub1.edb separately by using your product? Can this tool able to convert EDB file size more than 10GB? Yes, this application can convert any size EDB file. I was migrating EDB to PST using PowerShell cmdlets without knowing that this command utiltity does not support 64-bit machines. Then I searched on the internet and got your tool which produces effecient & accurate results. Thanks Team! The best part of the tool is it can run without Microsoft Exchange Server, PowerShell & Active Directory. This standalone application provides intuitive interface that export my huge EDB to PST in just 4 steps. Recently, I wanted to import some of my Exchange EDB mails to Outlook email client. I only knew that Outlook supports PST format so I had to convert EDB file to PST format. I used this tool to convert Exchange EDB to PST and it did a brilliant job! I have used EDB to PST Converter Tool to convert Password Protected Exchange EDB file, this tool works wonderfully and easily converted into PST without changing the Meta content. Also the Tool contains various useful feature so I recommend this tool. Thanks to development team. I was searching for an EDB to PST converter tool that can convert selective folders from the Exchange EDB file and after various search I found this outstanding tool and successfully converted selected EDB file into PST. Great thanks to be there. One day I am in big trouble because I am unable to access password protected edb file, then I searched on internet a found many tools but some are unable to recover data and some are very hectic to use then one of my friend suggest me to use your product to resolve this use. I used this reliable Exchange to Outlook utility and recovered all data and then converted into pst format as well and the tool is quite easy to use. Thanks to for developing a great EDB to PST Converter Tool.